Director of rugby Jim Mallinder has praised Teimana Harrison's improvement after Northampton's draw with Racing 92 in the European Champions Cup. 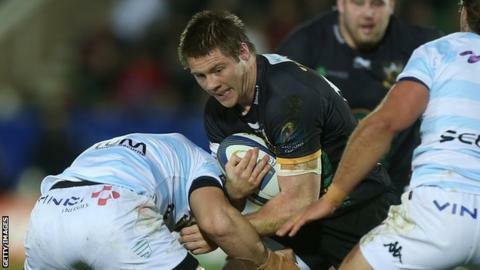 The 23-year-old New Zealander has been playing at flanker following injuries to Calum Clark and Tom Wood. "He has always had natural ability but that is not good enough at this level," Mallinder told BBC Radio Northampton. "You have got to be a smart rugby player as well and I think that is what he has improved." Mallinder added: "You also need physicality and Harrison played like a wild man in the first couple of years and got himself injured but he has worked hard on his physique and his tactics." When Harrison was questioned about his recent improvement on the field he jokingly put it down to "just eating my greens!" However, Harrison said 26-year-old Clark, who made his England debut against France in August, was offering offering advice to help with his game. "Clark has been sitting down with me after every game and going through and telling me what I should be doing," Harrison added. "I have essentially been learning off the best."